Over the past decade, the international Cassini mission has revealed intense activity at the southern pole of Saturn's icy moon, Enceladus, with warm fractures venting water-rich jets that hint at an underground sea. A new study, based on microwave observations of this region, shows that the moon is warmer than expected just a few meters below its icy surface. This suggests that heat is produced over a broad area in this polar region and transported under the crust, and that Enceladus' reservoir of liquid water might be lurking only a few kilometers beneath. 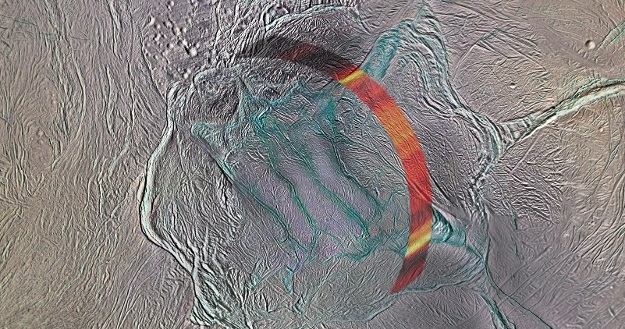 "During this flyby, we obtained the first and, unfortunately, only high-resolution observations of Enceladus' south pole at microwave wavelengths," says Alice Le Gall from Laboratoire Atmosphères, Milieux, Observations Spatiales (LATMOS), and Université Versailles Saint-Quentin (UVSQ), France. Alice is an associate member of the Cassini RADAR instrument team and the lead scientist of the new study, published in Nature Astronomy. "These observations provide a unique insight into what is going on beneath the surface. They show that the first few meters below the surface of the area that we investigated, although at a glacial 50-60 K, are much warmer than we had expected: likely up to 20 K warmer in some places," she adds. Those "Tiger Stripes" look like creme de menthè stripes over an icy white background!